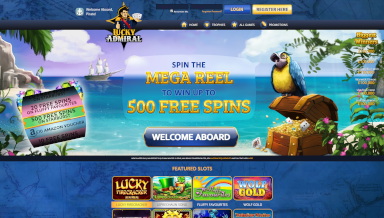 Lucky Admiral Casino is an online casino for pirates, which runs on a Cozy Games platform. 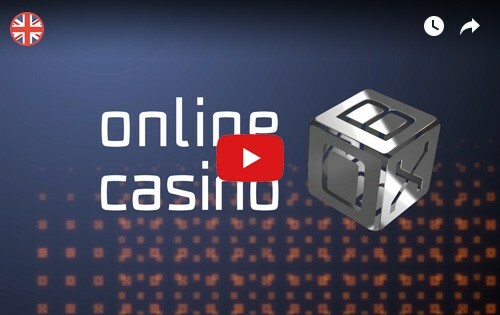 All games can be enjoyed both on desktops and mobile devices, and this is a secure casino that operates with a gaming license from the British Gambling Commission. Lucky Admiral Casino opened in 2015 and over the years they have gained a lot of experience and knowledge, which makes them able to deliver satisfying casino experiences to all their customers. In this Lucky Admiral casino review we will take a look at all the features and promotions at the casino. When you play at Lucky Admiral Casino you can take advantage of a nice range of bonuses, including no deposit bonuses, cashback bonuses and free spins. New players at Lucky Admiral Casino get to spin the Mega Reel, which can lead to amazing prizes like Amazon vouchers, or 500 free spins on popular slot machine games. Once you are in the casino there are additional promotions available. You do not need a Lucky Admiral bonus code to take advantage of the welcome bonus package, just go straight to their website. 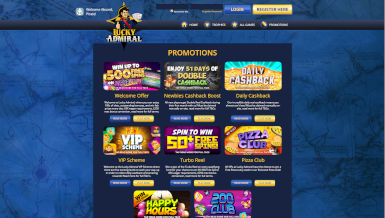 Lucky Admiral UK also offers unique daily cashback deals, which means that if you lose one day, you get up to 10% real cashback the following day. This is a great way of showing appreciation to your loyal players. The higher VIP-level you have, the daily cashback you will be given. Daily cashback is calculated as a percentage of daily deposits, minus withdrawals requested, minus any current balance in your account, between 00:00 to 23:59. This casino offers games from many leading software provider with the Cozy Games platform. 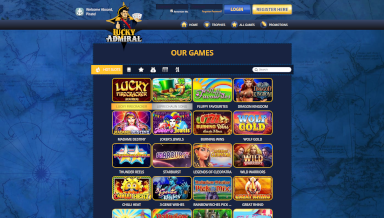 This means that you can enjoy popular games like Mega Moolah, Starburst, Dragon Kingdom, Burning Wins, Madame Destiny, Wold Gold and Lucky Firecracker. All important features and functions are available at this casino. They make sure to entertain their customers with a range of different game types, secure payments, and customer support. Lucky Admiral Casino offers several hundred slot machines, bingo, jackpot games, table and some video poker, so there is a lot of different types of experiences waiting for you there. Lucky Admiral bingo is a popular place for British bingo lovers, where you can enjoy Lucky Stars, Free Bingo, VIP Free Bingo, Fair & Square, and Pay Day Jackpot. Make deposits with Maestro, MasterCard, Neteller, Paysafecard, Solo, Switch, Ukash, Visa, or Visa Electron. Withdrawals can be made with the same methods, except Paysafecard or Ukash, and the casino has a withdrawal limit of 5000 GBP per week. Lucky Admiral Casino offers customer support via e-mail, and there is also a FAQ-section available with many answers to general questions, which can save you a lot of time. This casino is only available for players in the United Kingdom. 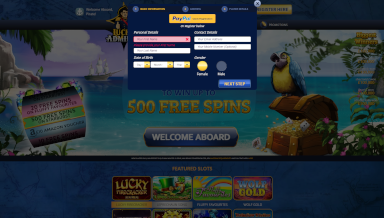 Lucky Admiral Casino is a great casino for mobile players. The site is compatible with all big brands and platforms, like iOS and Android. Use your smartphone or tablet at any time and play your favourites when you are out and about. There is no need to download an app, because the site has been entirely optimized for mobile gaming. This is a fun and safe casino for British casino players, and they offer many safe payment options. Jackpot players can choose from over 40 different jackpot games and take their chance on life-changing wins. Although the game portfolio may seem a bit limited in some categories, this casino still has a lot to offer. To sum it all up, we can recommend this casino to British casino players that enjoy to play casino games from a lot of different software developers. It is a safe and secure casino with several interesting ongoing promotions, so they have a lot to offer.